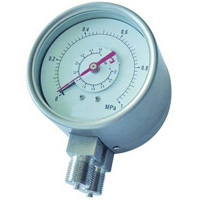 Differential gauge is used to measure the pressure difference under the same conditions. It is mainly used in petrochemical, pipelines and other areas. Ma Anshan Exact Instrument Co., Ltd is a professional manufacturer of differential gauge. Our products are widely used in oil, chemical industry, metallurgy, electricity, manufacture, papermaking, food, energy, etc. Our products have been exported to U.S.A, Canada, Europe, Spain, Egypt and South-east Asia, mid-east and so on.